Toyota will get the quick and short post. I have come to the conclusion that it is the front ends that are driving me to drink. Worst in the business. Worse then Hyundai. Yikes. Mercifully, the FJ doesn't have it. 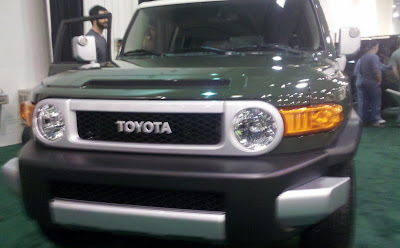 The FJ is one of those cars that I just have a 'thing' for. Whilst looking at the car we were approached by a sales person. "Nice to see the FJ here this year" I said. The salesman said "there was one guy on the internet who said the car had been discontinued, but it isn't true." I was a bit confused, but it is good the car is back at the show. One other thing about the FJ. This guy in the pictures dad was there. I shot this photo and he commented about paying him for it. Is this because he looked like the kind of guy that should be buying this thing? It was strange. Note on brochure: smallest at the show. On page with a fold. Perhaps due to money being spent elsewhere? Nice to see the Camry still there in the mist of a bunch of boring/forgettable cars and trucks, because it is the Mount Everest of boring and forgettable. In fact. I think the Camry invented that. Anyway, not too much traffic in this area of the show. 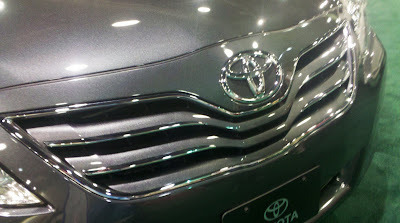 Perhaps Toyota should just make the Camry and FJ.